For my first book in Raquel's Summer Reading Classic Film Book Challenge, I chose BFI Classics: City Lights by Charles Maland. BFI Classics books are short reads (usually about 100-110 pages) about specific classic films. I think this is the third one that I've read now, and I really enjoy them! I wrote about their L'Avventura volume for the classic film book challenge last year. The review is on my blog here. City Lights was on my 30 before 30 list, a list that I compiled last year of 30 movies I hadn't seen but wanted to watch before turning 30 this November. The movies that comprise the list mainly fall into one of two categories -- movies I've always wanted to see personally, and movies that have cultural significance. Some films are referenced in pop culture so much that I often feel like I've missed out on some massive communal experience by not seeing them. City Lights falls into both of those categories. I love Chaplin and I'd seen all of his feature length films, save this one and A Countess From Hong Kong. I had the immense pleasure of getting to see City Lights for the first time a couple of months ago at the New York Philharmonic. The only term that could fully convey the experience is "exquisite." I'm actually glad that this somehow eluded me for 29 years, so that my first viewing could be so beautiful. And reading this book only enhanced my appreciation for the movie and the experience of seeing it for the first time. The BFI book is a comprehensive study of the film -- it tackles everything! The budget, the movie's reception, the personal circumstances that might have led Chaplin to this story, the shooting schedule, scene-by-scene breakdowns, contemporary criticisms, and the film's legacy. I felt like some of the information was a little too tedious -- I could have personally done without the extensive budgetary discussions -- but overall I walked away from this feeling informed, and more importantly (to me, at least) like I had a better understanding of Chaplin's motives and what he wanted people to get from the movie. It also gave me a greater appreciation for how much work he put into his projects. I knew that he had written, produced, directed, starred in, and composed the score for, City Lights. 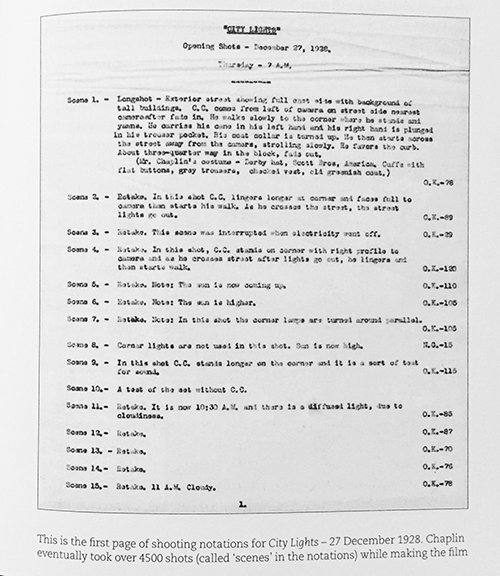 But seeing his actual shooting notations (see below) blew my mind. I should note that my level of film appreciation is usually just that -- mere appreciation. I don't know very much about the actual craft, the amount of preparation that goes into shooting a movie, the terms for camera angles or lighting, etc. But the author does a good job of explaining these sorts of things in ways that a novice can understand, and manages to convey just how meticulous a craftsman Chaplin was when working on City Lights (and, I'm sure, all of his movies.) He points out things that I never would have noticed before - like how Virginia Cherrill's hair is backlit in the last scene, or how Chaplin uses silence [a lack of music] to heighten the emotion of certain moments. "Her gesture of bringing the tramp's hand to her heart and the broadening of the tramp's smile at the end of the final shot can lead an optimist to hope their relationship may flower. Our knowledge of the flower girl's expectation of a rich and kind benefactor, of the tramp's social marginality, and the darker emotional tone of the score's final strains suggest to the pessimist -- or even the realist -- that this relationship will never work. 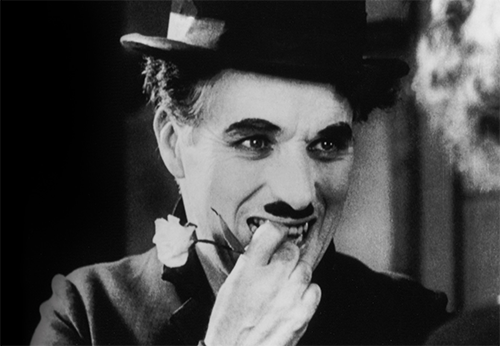 But Chaplin leaves us poised on the edge, without a definitive answer." Although the tramp clearly is in love with the flower girl, I don't think that a relationship between the two is essential to the happy ending. Throughout the entire film the tramp exhibits a self-sacrificial quality, even going to prison so that the flower girl could have the money for her eye surgery. He does this because his sole purpose is to make her happy. Therefore, seeing her success, her happiness, her restored vision, and knowing that he played a role in making it happen, should be more than enough satisfaction for the tramp. Is it possible that the tramp and the flower girl will never be involved romantically? Yes. But I don't actually think that even factors into the ending. To me, it's a happy ending because the tramp is clearly beside himself with joy. His face in the last shot has to be one of the purest expressions of happiness ever committed to film. I love this movie, and this sounds like a great book. And I agree with your interpretation of the end, I thought it was a very happy ending. And when the flower girl says "I can see now", I think it has deeper meaning -- she can see that appearances aren't everything, and that kindness is more important than riches. Whatever happens afterwards, they are both happy in this moment, and that is enough. Fantastic review Kate! I have seen a lot of these BFI books but have never checked one out. Thanks for explaining what's involved. I used to beat myself up about not having seen some of the major classics. Then I remember some of the most amazing first time experiences I had when I had put off seeing something and now I'm okay holding off. Cool movies. I saw in online movie on site http://movie4k.sc/ In normal quality. Please add own comment of film site..